Generally, a cohort is a group of users who share a defining characteristic (for instance, the date when a certain action took place). Cohort analysis is essential for analyzing the behavior of users divided into groups over time with a certain frequency rate. Above all, cohort analysis provides marketers with insights on their users based on deep segmentation. On early stages of marketing activity, cohort reports provide quality data for KPIs definition and refinement. Later on, cohorts make it possible for marketers to determine Apple Search Ads performance trends and apply them to further campaigns and overall improvement of their users’ lifetime value (LTV). In the context of Apple Search Ads, cohort analysis provides you with information on keywords which are likely to draw lucrative users. It’s possible thanks to the evaluation of ROAS and revenue from cohort users tracking their purchasing activity over a certain time period. Thus, you can identify which campaigns, ad groups, keywords, etc. call for optimization. Normally, mobile publishers are interested in return of investments in ads by a certain period (for example, by the 14th day of a user’s lifetime in the app). That’s why it’s not enough to know total ROAS as it indicates ads profitability from the day a user tapped on the banner to the present moment. 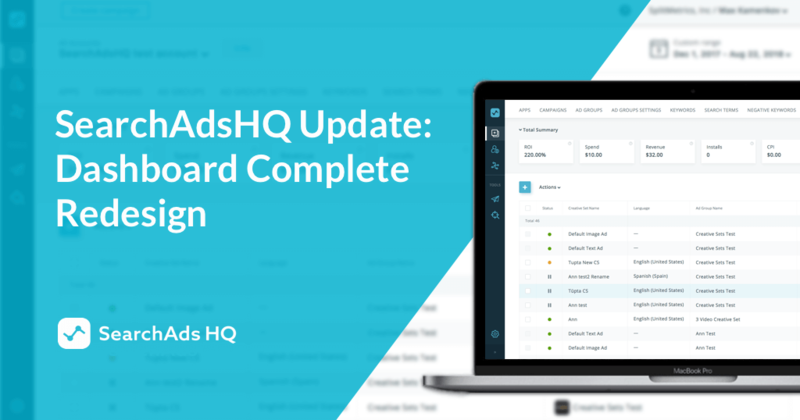 Updated SearchAdsHQ metrics allow you to access data on ROAS and Revenue of exact days and optimize your Apple Search Ads campaigns accordingly. 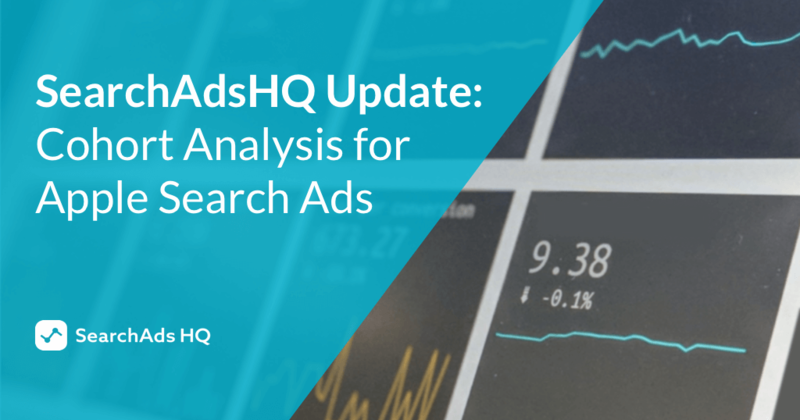 When it comes to Apple Search Ads management, SearchAdsHQ is the most efficient way of checking if your investments in ads are paying off. SearchAdsHQ uses tap date (the date when a user tapped on the ad banner) as the attribute for forming cohorts. All users that tapped the ad on the same day represent one cohort within the platform. For example, the users that tapped an Apple Search Ads banner on September 1, 2018 and the users which clicked on the same banner on September 2, 2018 form two different cohorts. SearchAdsHQ cohort analysis demonstrates cumulative values which means that, let’s say, RеvenueD3 doesn’t indicate revenue on the 3d day but the sum of revenues from day 1, 2 and 3 all together. It’s also important to consider that in SearchAdsHQ the day of install is referred to as day 0. SearchAdsHQ calculates days starting not from the day of a tap but from the day of install. The thing is the time span between tap and install barely influences purchasing behavior. Plus, it’s hard to influence user behavior before the install. However, you can affect further behavior of users via in-app marketing and it’s when cohort analysis comes at the right time. It helps you to track positive or negative dynamic of your marketing activity from cohort to cohort. day 0 – day of the first opening of an app. 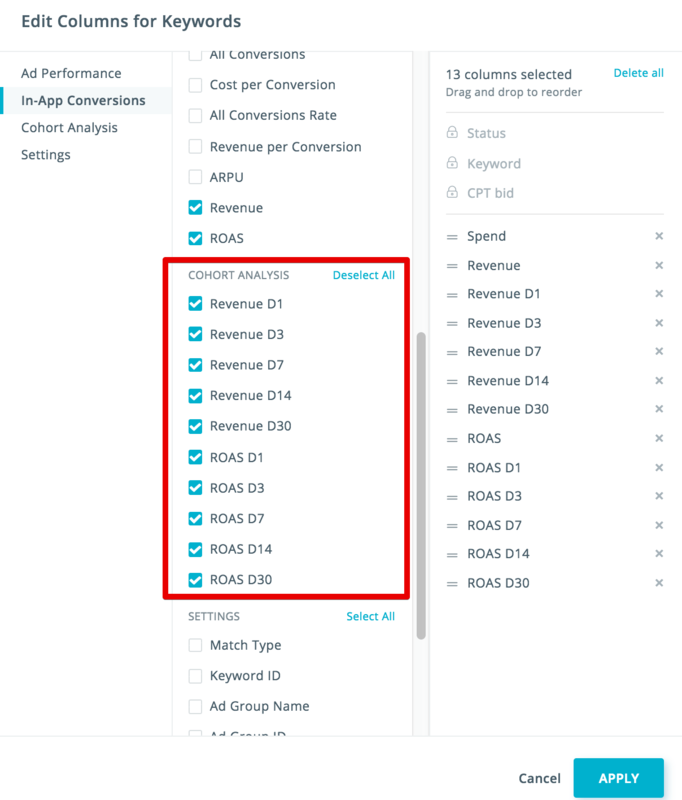 The best part is that these additional columns appear on all levels of your ad account (Ad Accounts, App, Campaign, Ad Group, Keywords). 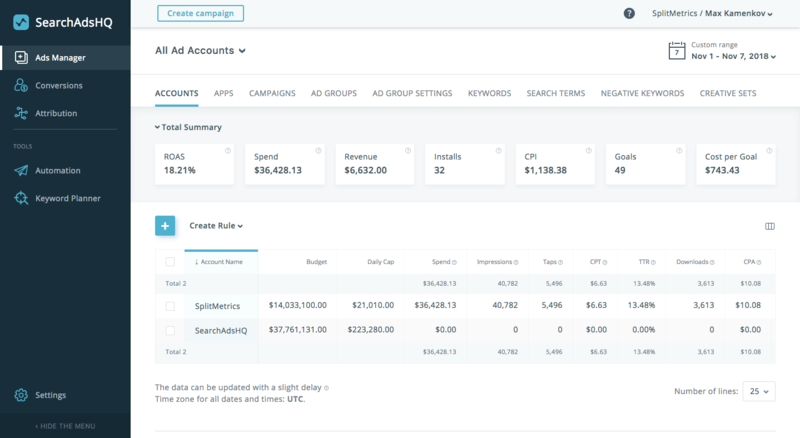 Thus, you can see and assess ROAS and ROI cohort analysis for each of your keywords as well as access cohort data on the level of campaign or app, etc. It lets you see a more complete picture of your Apple Search Ads activity. As it was mentioned above, SearchAdsHQ cohorts analysis adds flexibility to the automatic rules our tool provides. Let’s consider an example of applying SearchAdsHQ cohort analysis for streamlining Apple Search Ads management. The companies which are engaged in optimizing of their ROAS have a clear understanding of their KPI as a rule. For instance, an app publisher plans to return all ad spend on the 7th day of the app being used by a customer. Thus, the goal is to achieve ROAS day7 = 100%. SearchAdsHQ users can gear up the process of achieving such results by creating automated rules utilizing cohort metrics. 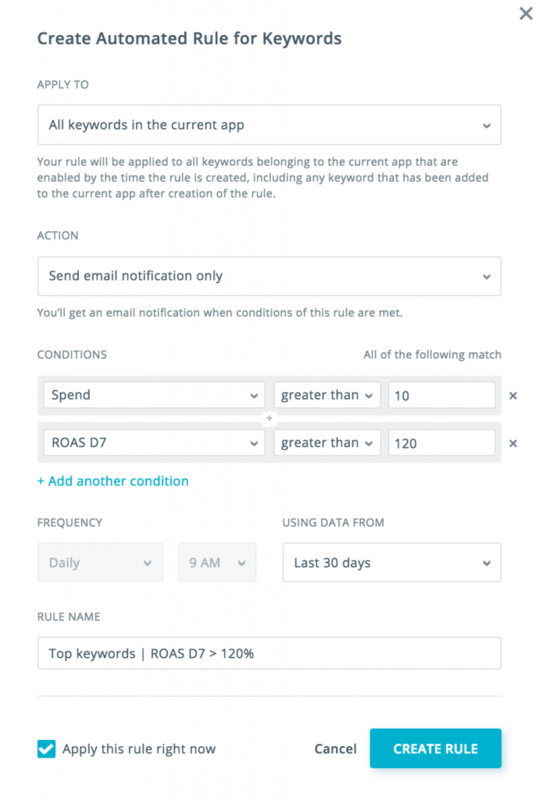 For example, it’s possible to set auto-rules to adjust keywords bids to the data from cohort metrics. increase budget or daily cap of campaigns that achieved KPI, etc. More granular filters let you get a thorough picture of your ads performance and bring the optimization of Apple Search Ads to a new quality level. How much time does it take to return their investments in Apple Search Ads? How much money do they make thanks to their Search Ads campaigns? Cohort analysis for Apple Search Ads is a great feature which gains particular significance when it comes to app publishers that use ROAS as their guideline. For instance, the majority of game publishers use dynamic value in events which means that the same event, let’s say, «Purchases» can return 5$ and 15$ as users can make purchases with varying prices. Furthermore, if you download CSV report, all new cohort metrics regarding your Apple Search Ads campaigns will be included. With its growth and development, Apple Search Ads management demands more attention and dedication. Indeed, managing campaigns for 2 storefronts is way easier than for 13 (by the way, the latter number reflects the reality of an ASA manager better after the latest storefronts update). On top of that, work with Apple Creative Sets calls for precision and commitment as well. Apple Search Ads is destined to further growth, there is no denying. 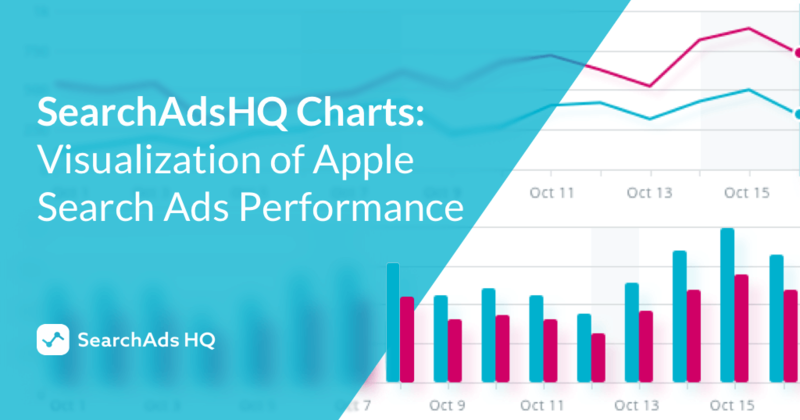 That’s why it’s high time to equip your user acquisition team with the best Apple Search Ads management tool on the market – SearchAdsHQ. Our platform lets you make all Apple Search Ads activities profitable at scale and take only data-driven decisions on the fly. This is possible thanks to SearchAdsHQ advanced automatic rules, cohort analysis, automated CPA bidder, support of all storefronts and Apple Search Ads Creative Sets, comprehensive and intuitive dashboard and dozens of other vital features which predetermine great performance of your ad campaigns with minimum effort and human touch.